How do you manage and create content to keep your customers engaged multiple times per week? Well, you don’t. You sign on with a professional social media content writing service and get back to working on your business. So, who do you get to do this crucial part of your business for you? 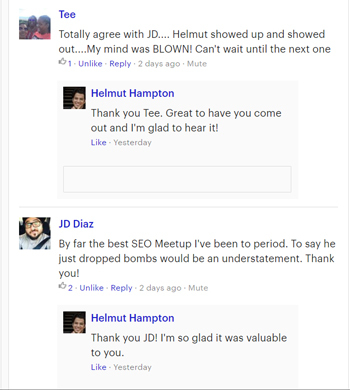 Here’s what people had to say about our digital marketing Tampa Meetup where Helmut Hampton presented on social properties. So, let us take care of writing and publishing regular social media content for your business. TIP: In general, Twitter and Facebook are better for local businesses while LinkedIn is better for business professionals and growing your personal brand. However, markets and industries can vary and we recommend you select whichever social media platforms you feel will connect best with your customers or clients. 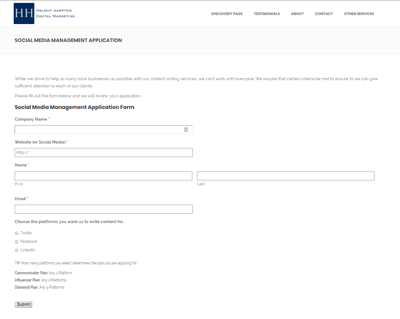 Once you fill out our application form. We will review your business to make sure you meet our qualifications and to ensure that our writing team can produce high quality content for you. We want to make sure it is a good fit. Then, if everything looks good, we will send you an invoice for your chosen plan. It will take 10 business days from receiving payment to get your account live and have the first week’s content ready to go. At this point, your work is done! We’ll keep your social media buzzing from here on out. Once your account is live, you will receive an email notification for you to log in to your dashboard. In your dashboard, you can see the content that will be published the following week. If you’re more interested in getting traffic to your website, we suggest to visit our local search engine optimization pages. According to Google, we are the best SEO company in Citrus Park, Westchase, and Keystone.